meet the eklavya who is instrumental at visualization, creation and implementation, sudhir kuduchkar, the creator of himself. the benevolent culprit behind the existence of three dot designs, sudhir himself demonstrates to be a great learner and adapter witnessing the curvature of technological advancement. he is lovingly known as bapu. during his 15+ years of creation and design, he has sailed from an era of old school to the modern ways and means in visual communication. he turned to be the mouse charmer creating magic with his abundant talent and sharp skills which is one of the major reasons why he has sustained commercially and as an individual artist. this deadline-slogger is such a design mate for whom the journey from imagination to execution is en route functioning with advertising agencies and corporates in design, management and fabrication without undermining the significance of each. he is compassionate yet possesses a strict approach to work and commitment. 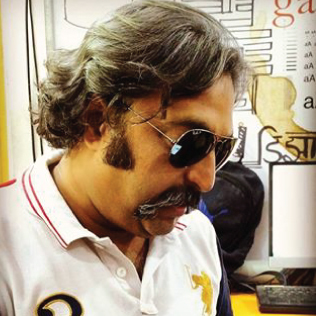 in terms of ideation and creativity, he is the whetstone and the sole authority thus performing the leadership supervising the creative output of a crew of 15. his innovatory prowess has a combined lead in branding/brochure/designing/calendar designing/exhibition & stall designing/web designing as well as production and printing technique expertise. his skillful dominance magnifies as execution and delivery with fascinations in letterpress, typography & photography. his thorough knowledge of pre-press/press/post-press techniques has also stood him in good stead. his credence lies in delivering the best output in a minimal stretch of time. design being his soul, his priorities extend to his love for travelling as well as touching old bygone moments with his buddies.